I have been making quite a few of these snowflakes in white and pale colours and now pleased with them. My aim was to use bugle beads in the pattern, partly because I have so many of them but also I think they do enhance a tatted snowflake. Oh and by the way it is made in one go. Here are some more Christmas Trees on buttons and now I really must get on and start writing cards etc. If anyone is interested in the snowflake pattern please comment. It has not been written out fully although I am pleased to share it with anyone if there is a demand, otherwise I will leave it so that only I am able to understand the instructions! OH, I think it's quite lovely! I love the snowflake and would like the pattern if you should ever happen to write it. Very good job. The snowflake is gorgeous. I would love a copy. I like your snowflake, good idea to use up your bugles (I've got loads too...!). My internet has been going out and in all day long I can barley have time to leave a post. I think I just left a comment on your blog for tat haven's in stead, and I it keep turning off on me so I got in a hurry and messed up. I apologize if it did. :( I do believe I left a comment on yours and I'll find out later on today, Love the snowflake and great use of the bugle beads! What a lovely snowflake, I love your colours you used, so pale and pretty, I am sure I am not the only one who would love to try the pattern. your snowflake is very pretty and so are your trees. A pattern by Sally Yeah! but it is certainly your prerogative to make it public, or keep it to yourself. Thanks everyone, I was just being really lazy and thinking if no one wanted the pattern then I could muddle through making endless snowflakes without writing it out properly! But it looks like I need to sit down and sort it out. Oh yes! 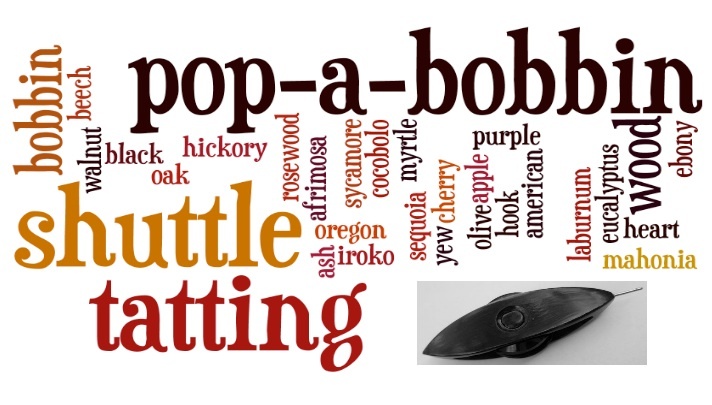 - if you have time to write out the pattern, I would love to have it, I want to see how the "arms" of the flake are done! I would love to add your snowflake to my Christmas tree -I think it is so beautiful! Look, look -- lots of demand! 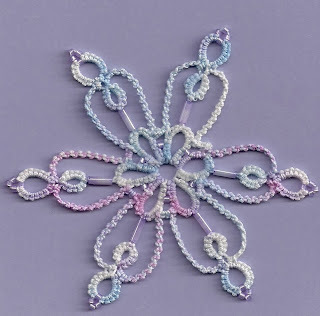 I'd love to have the pattern for your snowflake because one can never have too many snowflakes, and because it's pretty. I like your use of lock chains! Lovely snowflake! One thing about writing the pattern out properly is that you can come back to it later and not have to remember exactly what you did. But I know it's a lot of work. A lovely, ice cool snowflake. I too would love a copy of your pattern. Your snowflake is beautiful. The colors remind me of winter. Would be interested in your pattern as well. 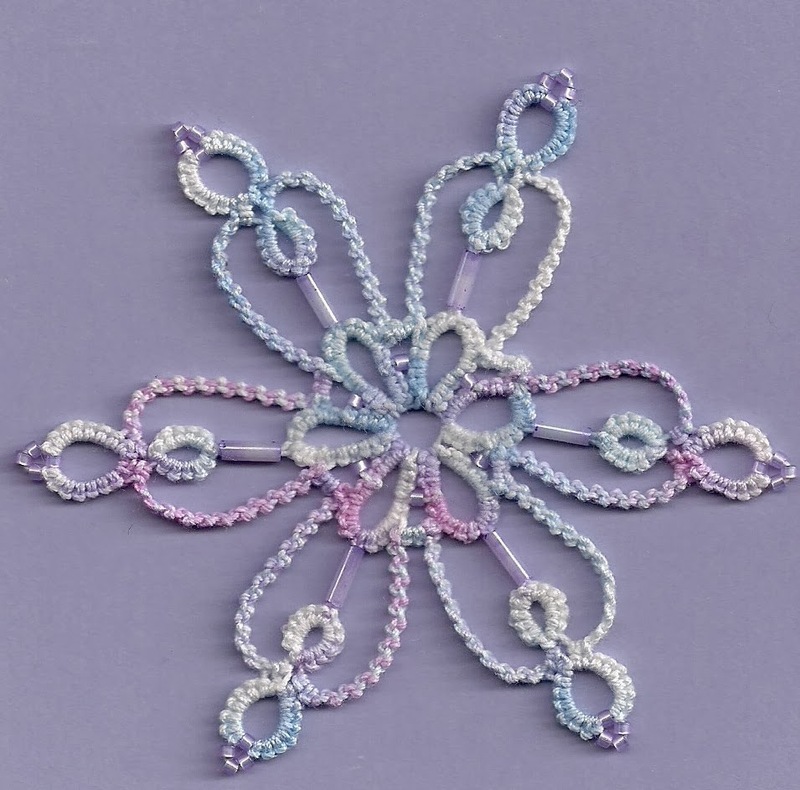 I would love a copy of the pattern, my daughter is requesting tatting from me, I let her choose some of my ornaments/tatting from years past-made when she was a little girl. I am currently doing a lot of knitting but will have to start tatting again. Tammy I have written the pattern down and it is on the blog post after this one or click on to the right hand side of my blog and underneath PATTNERS it is the Snowflake one. Yes do start tatting again!